10 A None No Power Seat 10 A does not recline due to the exit row behind. 10 B None No Power Seat 10 B does not recline due to the exit row behind. 10 E None No Power Seat 10 E does not recline due to the exit row behind. 11 A None No Power Seat 11 A has some extra legroom due to the exit row, but it does not recline. There is no floor storage for this seat during takeoff and landing. The tray table is in the armrest, making the armrest immovable and slightly reducing seat width. 11 B None No Power Seat 11 B has some extra legroom due to the exit row, but it does not recline. There is no floor storage for this seat during takeoff and landing. The tray table is in the armrest, making the armrest immovable and slightly reducing seat width. 11 C None No Power Seat 11 C has some extra legroom due to the exit row, but it does not recline. There is no floor storage for this seat during takeoff and landing. The tray table is in the armrest, making the armrest immovable and slightly reducing seat width. 11 D None No Power Seat 11 D has some extra legroom due to the exit row, but it does not recline. There is no floor storage for this seat during takeoff and landing. The tray table is in the armrest, making the armrest immovable and slightly reducing seat width. 11 E None No Power Seat 11 E has some extra legroom due to the exit row, but it does not recline. There is no floor storage for this seat during takeoff and landing. The tray table is in the armrest, making the armrest immovable and slightly reducing seat width. 11 F None No Power Seat 11 F has some extra legroom due to the exit row, but it does not recline. There is no floor storage for this seat during takeoff and landing. The tray table is in the armrest, making the armrest immovable and slightly reducing seat width. 12 A None No Power Seat 12 A has some extra legroom due to the exit row. There is no floor storage for this seat during takeoff and landing. The tray table is in the armrest, making the armrest immovable and slightly reducing seat width. 12 B None No Power Seat 12 B has some extra legroom due to the exit row. There is no floor storage for this seat during takeoff and landing. The tray table is in the armrest, making the armrest immovable and slightly reducing seat width. 12 C None No Power Seat 12 C has some extra legroom due to the exit row. There is no floor storage for this seat during takeoff and landing. The tray table is in the armrest, making the armrest immovable and slightly reducing seat width. 12 D None No Power Seat 12 D has some extra legroom due to the exit row. There is no floor storage for this seat during takeoff and landing. The tray table is in the armrest, making the armrest immovable and slightly reducing seat width. 12 E None No Power Seat 12 E has some extra legroom due to the exit row. There is no floor storage for this seat during takeoff and landing. The tray table is in the armrest, making the armrest immovable and slightly reducing seat width. 12 F None No Power Seat 12 F has some extra legroom due to the exit row. There is no floor storage for this seat during takeoff and landing. The tray table is in the armrest, making the armrest immovable and slightly reducing seat width. 27 A None No Power Seat 27 A has limited recline and slightly reduced seat width due to the curvature of the plane. The proximity to the galley and lavatory may be bothersome. 27 B None No Power Seat 27 B has limited recline and slightly reduced seat width due to the curvature of the plane. The proximity to the galley and lavatory may be bothersome. 27 C None No Power Seat 27 C has limited recline and slightly reduced seat width due to the curvature of the plane. The proximity to the galley and lavatory may be bothersome. 27 D None No Power Seat 27 D is a standard economy seat. The proximity to the galley and lavatory may be bothersome. 28 D None No Power Seat 28 D has limited recline and slightly reduced seat width due to the curvature of the plane. The proximity to the galley and lavatory may be bothersome. 28 E None No Power Seat 28 E has limited recline and slightly reduced seat width due to the curvature of the plane. The proximity to the galley and lavatory may be bothersome. 28 F None No Power Seat 28 F has limited recline and slightly reduced seat width due to the curvature of the plane. The proximity to the galley and lavatory may be bothersome. 4 A None No Power Seat 4 A is a standard Business Class seat however noise from the more crowded economy cabin may be disruptive. 4 C None No Power Seat 4 C is a standard Business Class seat however noise from the more crowded economy cabin may be disruptive. 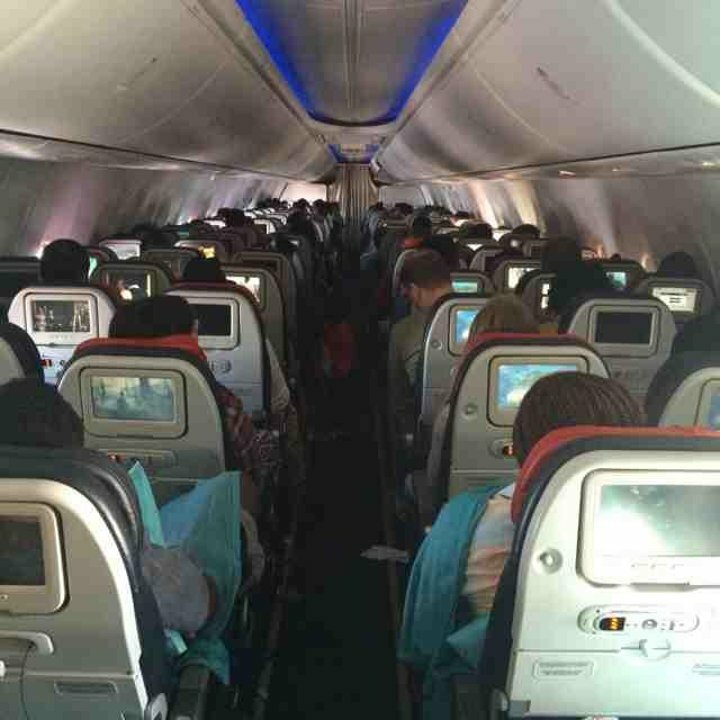 4 D None No Power Seat 4 D is a standard Business Class seat however noise from the more crowded economy cabin may be disruptive. 4 F None No Power Seat 4 F is a standard Business Class seat however noise from the more crowded economy cabin may be disruptive. 5 A None No Power Seat 5 A is a standard economy seat. However, this seat may have restricted legroom due to the position of the bulkhead. Passengers traveling with infants are often seated here as there is a bassinet position in this row. 5 B None No Power Seat 5 B is a standard economy seat. However, this seat may have restricted legroom due to the position of the bulkhead. 5 C None No Power Seat 5 C is a standard economy seat. However, this seat may have restricted legroom due to the position of the bulkhead. 5 D None No Power Seat 5 D is a standard economy seat. However, this seat may have restricted legroom due to the position of the bulkhead. 5 E None No Power Seat 5 E is a standard economy seat. However, this seat may have restricted legroom due to the position of the bulkhead. 5 F None No Power Seat 5 F is a standard economy seat. However, this seat may have restricted legroom due to the position of the bulkhead. Passengers traveling with infants are often seated here as there is a bassinet position in this row. 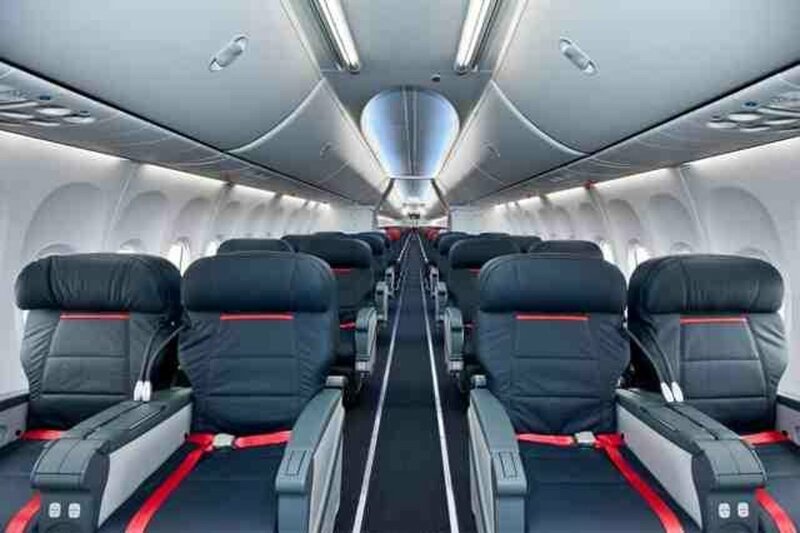 This Turkish Airlines 737-900ER features 16 Business class recliner seats and 135 seats in Economy. This is a typical 737 which is fine for short flights, but for a long flight like IST-JRO (9:25 hr), it is a killer. Turkish Airlines keeps the plane extra warm, so it is very uncomfortable sitting in a hot box for so long. It is cooler in the rear near the lavatories, but seat 18D in the middle section is much too warm. Also they do not serve cold drinks, even if you ask for ice, you only get 1 ice cube which melts right away. 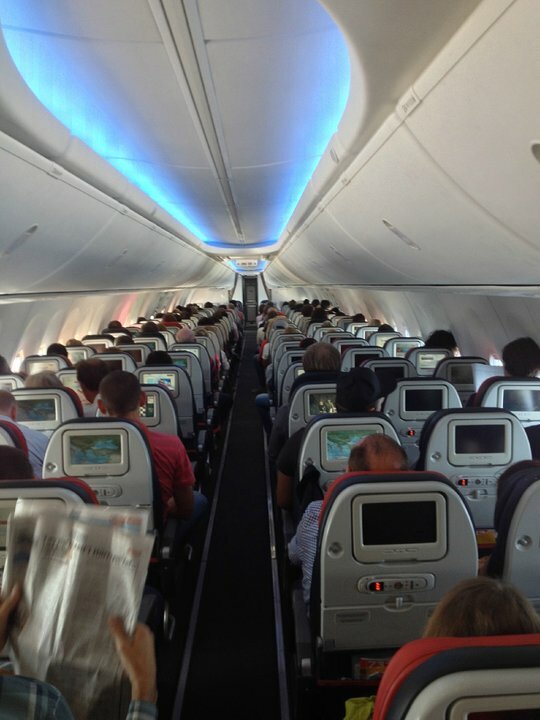 It may be better sitting closer to the rear of the airplane where you can get up and stretch and try to cool down. Be prepared to spend the next 9 hours panting because they seem to like it hot. On my flight seat 26a was the last row of the aircraft on the left hand side. Seat pitch was great and was at least 32 inches, possibly 33 inches. 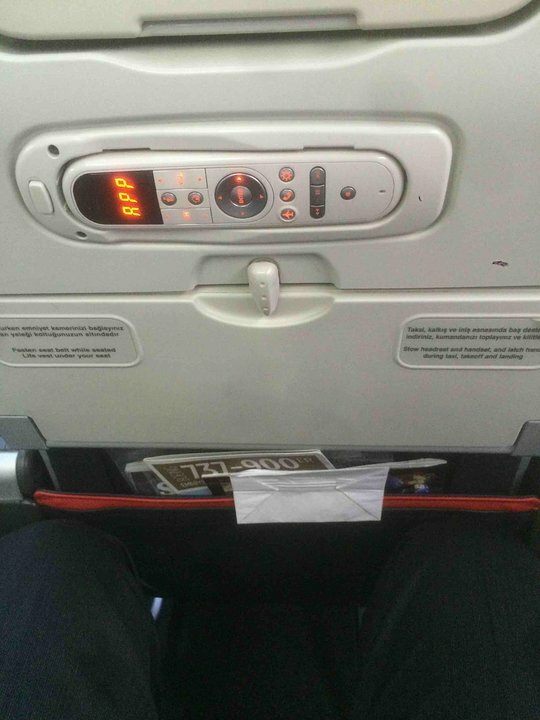 I am 6ft 1inch tall and had lots of legroom. The seat had a full recline as the wall behind was not close. Business class seats are very comfortable. These seats recline more than 6 inch. 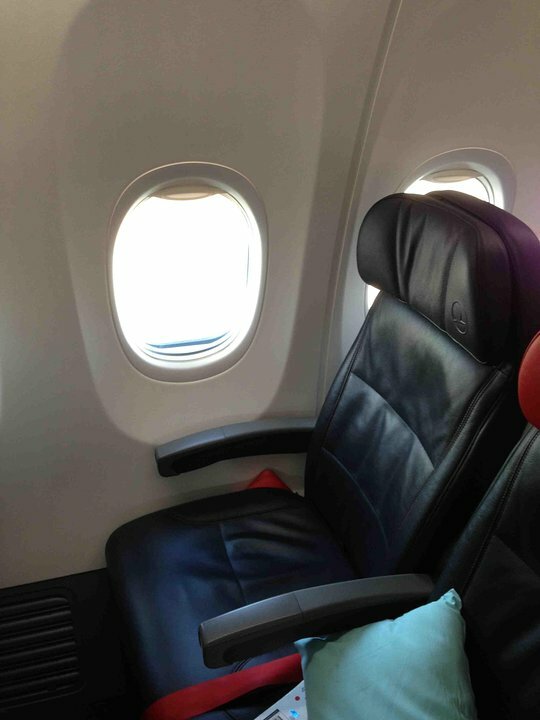 They are nearly similar with Turkish airlines 777-300 comfort (premium economy) class seats. Seat 04A was so cool for me. Because You have 3 windows to look outside (Especially while you're eating your meal *-*). Also You can see all seats.